Product Packaging:Frustration-Free Packaging Create Working ElectronicCircuits Snap Circuits Jr (SC-100) comes with over 30 components to create 101different electronic projects. The pieces, which include snap wires, slideswitches, an alarm circuit, a music integrated circuit, and a speaker, snaptogether easily on the included plastic grid--no soldering required. Eachpiece is numbered and color-coded to make identifying them easy. Thesecomponents combine to create working circuit boards just like the ones foundinside televisions, radios, and other electronic devices. 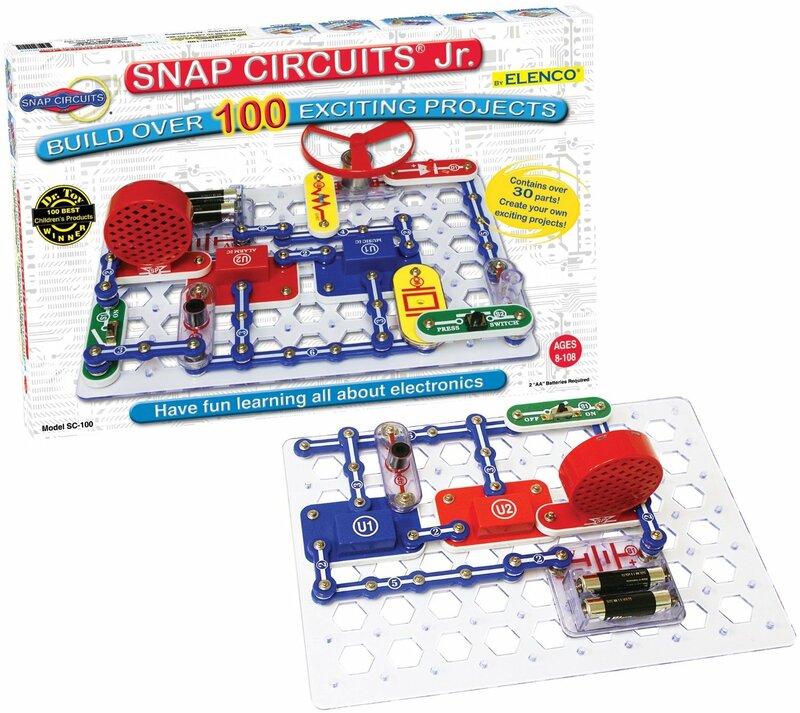 With its easy-to-follow instructions, Snap Circuits gives your child a hands-on education inhow electrical circuits work to run the everyday devices that they're familiarwith. They'll also gain valuable lessons in building and in followinginstructions. The project manual includes large color illustrations and simpledirections for each project. The projects include a sound-activated switch, amusical doorbell, a voice-controlled lamp, a flying saucer, and a light policesiren. With these projects, children will experiment with things like electricswitches, integrated circuits, digital circuits, fuses, and the transformationof circuit sounds into other sounds. Includes: Plastic snap-grid, 32electrical components, and 1 project manual.Recommended for children 8 andolder.